Retired Adm. Gary Roughead will spend calendar year 2012 as the Annenberg Distinguished Visiting Fellow at the Hoover Institution, Director John Raisian announced Monday. 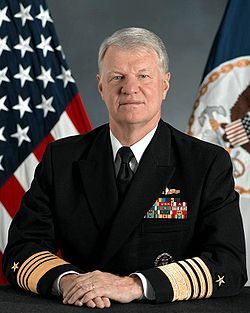 Retired Adm. Gary Roughead, as chief of naval operations. // Photo courtesy of U.S. Navy. Roughead, who stepped down as chief of naval operations and retired in September, will spend the year in residence at Hoover, located in Stanford, Calif. According to an announcement posted on Business Wire, Roughead will examine the “critical role of the military as part of the American way of life.” The announcement says that Roughead will work with former cabinet members George P. Shultz and William Perry, who also are in residence at Hoover. Roughead’s research will “contribute substantially to the Institution’s focus on the role of the military on current public policy formation,” the announcement states. The Mabus/Roughead team did more damage to the U.S. Navy than any two persons since Yamamoto and Nagumo.